So, you want to know how to make money online at Christmas? Today, I’m going to outline some surefire ways that you could generate some extra income during the Christmas period, (and beyond!). Is it me, or has this year just completely flown by. I’m sure I said that last year but, really… !! Apparently, the average Brit spends over £800 during the Christmas period and the average American spends over $900. As a result, many families feel there is no option but to go into debt. But what if you could make extra money to cover the costs? If you can’t make hundreds of pounds, at least a little extra on reducing that amount could reduce the stress!? Perhaps you could make enough money to pay for the big food shop… .some presents… or enough to stock up on wine and spirits for the festive season! Sounds good to me, so let’s dig in! How to make money from a simple blog. An essential way to make back some money back this Christmas – is through cashback. This is where you can get a percentage back on your purchases. My #1 choice for this is going to be Swagbucks. It’s free to join an their handy browser extension notify’s me of any cashback available to me – at any website I happen to land on. There is also other ways you can earn there via surveys, surfing the net paid offers. Lastly, you can earn from referring your friends and family to – you can earn 10% of anything they do for life. Sign up here – bonus $5. Well, you can go directly on to their website and find any discount deals available at all your favourite stores online, (simply by searching them up). However, the really cool thing is… That when you have the browser extension, Honey will notify you whenever there are deals available on the web. When you arrive at the checkout at thousands of stores online, honey will notify you of all best deals available. Often it will say there are several deals available and it will find the best possible one for you. It’s brilliant, never will you have to miss out on a deal again! What’s more – you can earn $5 for every friend you recommend honey to. And who wouldn’t want it? A free browser extension that can both make AND save money! Learn more about Honey here. #3 The Highest Paying Survey Site I’ve Found – Prolific! This is really a find and it still seems that not enough people know about this site yet, (at the time of writing). A UK based site, but accepts people from many countries. You’re paid in pounds, but it’s no problem because you’re paid into PayPal, (and can easily change currencies from there). I don’t know of any similar sites that have a set minimum wage – they can’t pay less than £5 per hour. So, if you do a 30 minute test, they cannot pay you any less than £2.50 to do it, (around $3.19). In my experience, I’ve had far shorter tests pay well though. Also… the HUGE bonus is, you won’t be screened out from these surveys and the surveys are all really interesting. This is because the surveys are created for academic research purposes, (so they’re not just companies looking for info to increase their profits!). It’s a great site, but you do have to be incredibly careful how you answer questions. If they don’t think you’re paying attention – they will ban you very quickly. Aside from that, it’s definitely a way you can make some extra cash in the lead up to Christmas. Sign up to Prolific here. My Top 10 Survey Sites USA. My Top 10 Survey Sites UK. #4 Make Christmas Related Items On Etsy! If you’re good at crafts, (or even if you’re not frankly…) there is bound to be something you can create and sell on this platform. There are TONNES of YouTube tutorials online, showing you exactly how to create homemade items that you can sell on. So, even if you have absolutely zero talent, you can certainly learn. I had a little look on the Etsy store and these were some things I found…. >> Find out more here. Nope… As you can see above… you don’t even need design skills to sell on Etsy! There are lots of plain text design shirts and clothing items that sell well on Etsy. And you don’t have to print and distribute the shirts yourself either! You can sign up for free for a print-on-demand service like Printful, which you can integrate with Etsy. You simply upload your designs to Printful, (which you can create easy with something like Pic Monkey) and THEY will do the printing and the shipping. If you prefer something sightly more creative, but still simple…. What about something like this!? How cute is this Elf Dust!?! This would be a simple item to create and there are lots of other items you can check out… Just have a browse on Etsy below. I’m not going to pretend that you can just jump on Etsy and start selling, but it’s definitely something to consider in the long-term too. Take a look on Etsy and take a look at items that you may be interested in creating. If you have no idea how to do it, I suggest you check out YouTube for step-by-step tutorials. This Etsy tutorial is really helpful, if you’re interested. Take a look at Etsy here. Christmas is the PERFECT time to have a clear out. Also, do your kids have Xmas related items, like Christmas jumpers, or Xmas PJ’s that are now too small? This will be the ideal time to sell them on, as people will now be looking on Ebay. It’s also a good opportunity to sell old unwanted toys, or ones your kids have outgrown – as this will be exactly when people will be looking to buy and make some savings. But you don’t have to worry about listing things and postage and packing, Music Magpie will actually come and collect your items, from your home! While you won’t get as much as you would selling it yourself, it’s a way to get rid of your junk very easily and make a small amount in the process. Sign up to Music Magpie. Learn more about Music Magpie. Weird things you can sell on Ebay. 10 easy ways to make $10. Usability Testing is a really great little side hustle, that not enough people talk about. Sites like User-Testing pay you to complete small tests on websites and provide feedback about them. This feedback helps the website owners to improve their sites, (many of which may not be fully completed when you do these tests). You need to be able to record your screen and your voice – User-Testing are able to record your screen, but you will need a decent microphone. You get paid $10 per 15 minute test completed and you will receive a star rating. The higher the star rating you achieve, the more tests you will be sent. There was a time when I wasn’t always sent that many, now I’m sent loads of them and don’t have enough time to check them out! So, if you have a little extra time on your hands, I recommend you check it out. They also have some tests that you’re able to complete on their App. I talk about lots of Apps over at this post and one is the job spotter app. It’s really only worth doing if you are in a fairly large town, or city… but you can get paid for snapping job Ads in shop windows and uploading them to the App. You may make roughly around $1/£1, but it will vary. Seeing as it’s Christmas, lots of companies are looking for extra staff at this time of year and it could be an additional way for you to earn a bit more. You can then get paid in Amazon vouchers. Find out other ways to make money with Amazon here. Can you make $1000 a month online, with your phone? Also: #8 A UK Opportunity…. Matched Betting. If you’re in the UK, then I suggest you check out Matched Betting. It’s a completely legal way that you can benefit from bookmakers, without gambling or risking any of your money. You make use of the free bets that bookmakers give you for signing up with them, (often when you sign up to a site they will have an offer, such as a free £10 bet, for example!). As you place bets to cover all outcomes, you cannot lose. The bets are placed strategically, to ensure you get the most profit possible. You don’t have to work out a strategy yourself, as there are programs online that help show you exactly how to do it all, step-by-step. I wasn’t someone who would normally place bets on horses and had zero understanding of how to do it…. and yet, I completely managed to do this myself. If you want to make some quick money before Christmas, this has to be one of the quickest and low-effort methods there is. Sign up to Matched Bets here. Learn more about Matched Betting. Will You Make Extra Cash This Christmas? If you want to make money with these options, you may want to try a few in one go and see how it goes. Obviously, Etsy would be the longer term plan and if you want a seasonal shop, you may want to create shops for other seasons as well, or in other niches. If you’re in the UK, Matched Betting is the sure way to make the most profit in the shortest amount of time. Whereas the quickest way to make a smaller amount, would be to join Prolific, or User-Testing. 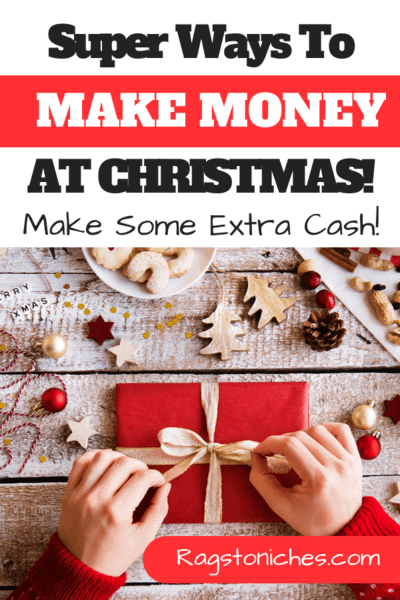 Do you have any other ways you make money online at Christmas? Want To Make Money Online, No Matter What The Season? Get Started Here!